CONGRATULATIONS ON MAKING IT TO THE LAST DAY OF THE 30 DAY KETO SHRED CHALLENGE! You are a committed winner. 98% of the people that started this challenge with you are not here on the final day to finish this challenge. I want you to pat yourself on the back for not quitting like these a**holes and actually committing to your fitness goals. Before we finish this last workout, I want to remind you to post your before and after picture on the Facebook group to qualify for the prize. After this workout, I have an article that will help you hit your Keto Macros every day even after you've finished this challenge. 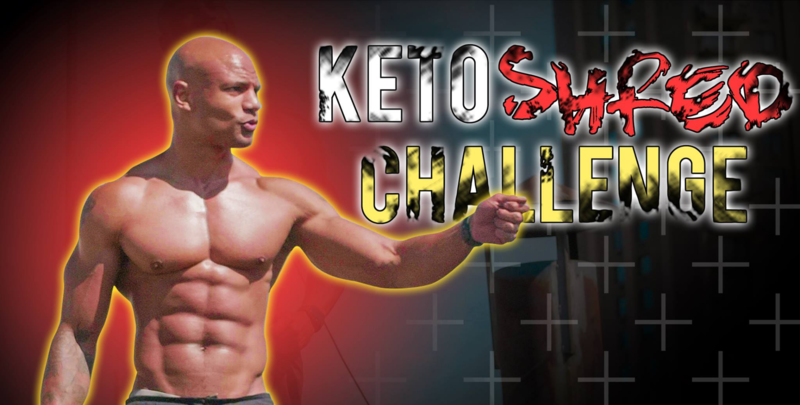 Don’t forget: to qualify for the challenge you must post your before/after pics in the 30 Day Keto Shred Facebook group before the end of the month. Alright, as promised, here’s how to effortlessly the perfect Keto Macros every single day. The #1 question I get hit up all the time about is how to hit the perfect Keto Macros of 75% fat, 20% protein and 5% carbs. *I always seem to be short on fat. I can easily to get the mid 60% or even lower 70% range, but how do I consistently stay at 75% or more without just gobbling butter and olive oil? *How do I stay keto at restaurants or family gatherings? It’s like f**king carb city everywhere outside my house! These are all valid concerns and things I personally struggled with incorporating keto into my own life. I remember getting really frustrated when I messed up my keto macros while traveling or eating brunch with friends, because I knew I wasn’t in ketosis and was missing all the benefits of rapid fat loss and higher energy. *The 1g per pound of bodyweight is not necessary for muscle retention. All you need is .8g per pound of lean body mass, which 20% more than covers. More on this later. *Some of the best foods to eat that are high fat and mid-low protein are eggs, bacon and burgers. I also highly suggest mixing heavy cream and butter with your morning coffee, as you’ll start each day with 80% fat. *Most restaurants let you sub fries for salads and buns with lettuce. You just have to grow comfortable with making waitresses looking at you funny. As for the fam, bring canned sardines and macadamia nuts with you if you can’t get Aunt Linda to crack a few eggs. Another one of the best ways to hit your Keto Macros perfectly everyday is to start your day with “Bulletproof Coffee” which consists of Coffee, MCT powder + butter. The macros work out to close to 100% fat, which is an awesome way to start your day on the right foot to getting into deep ketosis.